As in many projects, with Carols by Candlelight, the details are what make the difference. And in this effort, especially this year, there are thousands of details. Our theme is “Changed” with our focus on lives changed for Eternity. To clearly present this message, a lot of things had to change for FirstJackson and, in reality, for each of us. We were challenged to be a part of Forty Days of Prayer for Carols. Many were. It is obvious. So many people praying specifically for 500+ lives to change sent Satan into overdrive trying to stop us. We all know that Satan loves sound equipment. He’s been messing with that stuff for years. He has hopped into lighting in a big way at times, as well. This year – traffic – tape -safety lighting -traffic (did I mention that already?) are taking a beating. He has worked over the altos – a virus and the flu and family illness. He started in on the sopranos today with the same. And poor Chip Wilbanks (Sanctuary Choir President) has a huge trial that is going into its third week starting Monday and he is vocally wasted. So as we complete the i-dotting and t-crossing this afternoon, continue to pray for every effort. We are tweaking. It is like a bunch of busy little beavers all over the church pulling wagons, pushing carts, installing last-minute lighting, watching the painter get ready for tonight (great story he has), moving costumes, cleaning up stuff, checking our lists, checking them again. Pray for the new traffic flows into the building to work. Pray for a welcoming environment in the FHE Carols’ Coffee House. Pray for the ministry groups that are coming in tonight and that they will clearly hear the message. Pray for each other as we share the gifts we have been given to tell the story of Jesus. Pray as well for flexibility, for the ability to listen quickly, and for your senses to be heightened to the needs of those around you. You never know who is watching you. You never know who God will pair you with when someone has a specific need (happened to me already this week). I love and respect each of you. More importantly, God loves each one of you far more than I ever could. Count it all joy to serve Him this weekend and every day. “This One will be our peace.” What a promise. What a Savior! I am changed. Are you? 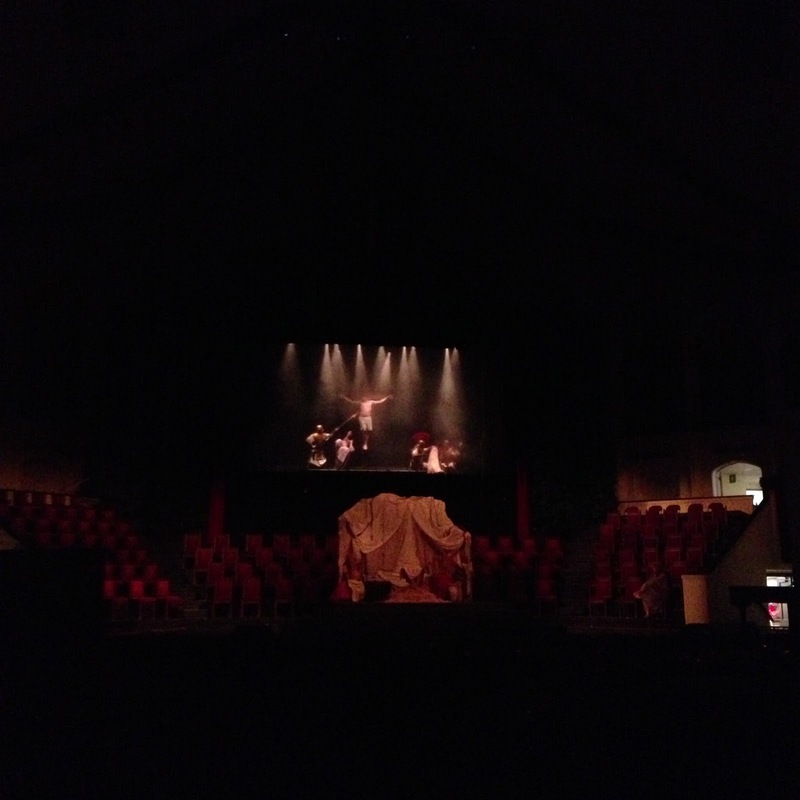 I took this photo during a “box scene” rehearsal in 2012. The Nativity and the Cross never appear together during Carols, but I think this fully captures the story of The Hope of Christmas. The simplicity of that stable on that quiet night to the horror of that cross on a terrible Friday in the most public of venues. In Genesis 3:15 (NIV): God condemns the serpent (Satan) and, while banishing Adam and Eve from paradise due to their bad decision-making, lays the groundwork for hope: And I will put enmity between you and the woman, and between your offspring and hers; he will crush your head, and you will strike his heel. “Her offspring” – Jesus, the Lamb of God. In the Old Testament, the sacrifices required a “perfect” lamb as the Passover lamb. Exodus 12:5 sets that out for the sons of Israel: Your lamb shall be an unblemished male a year old; you may take it from the sheep or from the goats. Yet it was obvious if you follow the patterns of sin / repentance / sin / repentance – that the sacrificing of a lamb, though representative, was not a final path to redemption. Yet when, as noted in an earlier post, when Abraham told Issac (Genesis 22:8 NASB) that God will provide for Himself the lamb for the burnt offering, my son, he knew that God already knew what was required for our redemption. When they hung Jesus on that cross instead of you or me, He was still perfect in every way – no blemish, no disobedience, no avoidance – fully God though fully man – and the perfect Lamb. At the cross that terrible day, consider what happened (Matthew 27:50-54, NASB): And Jesus cried out again with a loud voice, and yielded up His spirit. And behold, the veil of the temple was torn in two from top to bottom; and the earth shook and the rocks were split. The tombs were opened, and many bodies of the saints who had fallen asleep were raised; and coming out of the tombs after His resurrection they entered the holy city and appeared to many. Now the centurion, and those who were with him keeping guard over Jesus, when they saw the earthquake and the things that were happening, became very frightened and said, “Truly this was the Son of God!” And indeed He is. Behold the Lamb. I believe. During The Hope of Christmas, we are doing selections from The Symphony of Christmas. The opening scene reminds us that in Genesis 22:8 (NASB), Abraham told Issac as he prepared his only son for sacrifice in obedience to God that God will provide for Himself the lamb for the burnt offering, my son. 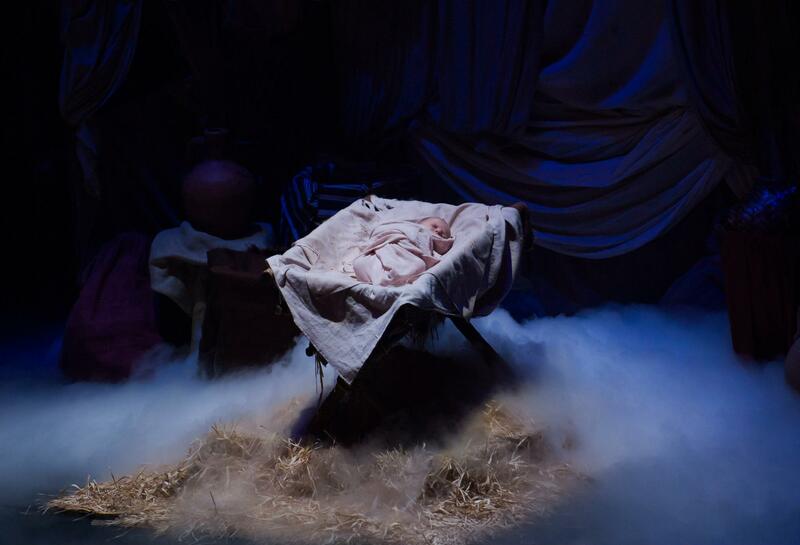 The following scenes capture the realization of the prophecy surrounding the birth of Jesus. The Angel appears to Mary and then to Joseph and then the couple begins their journey to Bethlehem. The Jews had waited for this for years – yet, they missed it. You see they sought an earthly king and not a Heavenly One. They (we) failed to get that God’s plan for them was not their (our) plans for themselves (ourselves). “O come, O come Emmanuel. And ransom captive Israel that mourns in lowly exile here. Until the Son of God appear. Rejoice, rejoice, Emmanuel. Shall come to thee, O Israel.” The basis of Israel’s plea is the promise found in Isaiah 7:14 (KJV): Therefore the Lord himself shall give you a sign; Behold, a virgin shall conceive, and bear a son, and shall call his name Immanuel. The promise is clear – a baby, conceived by a virgin, the Son of God. I just have never understood how they missed that point. I am certain there are a lot of things I don’t understand! So often we see in a situation what we want to see. God sees clearly. He knew the desires of the hearts of the Jews in the days of Jesus’ birth as He knows the desires of our hearts. Truly, we are not worthy to bow down at that manager and worship any more than those kings and shepherds were all those years ago. Yet because God provided the Lamb, we are redeemed! The Old Testament is rich with the prophecy of Jesus’ coming as “Emmanuel, God with us”. The little book of Micah so specifically tells this in chapter 5:2-4: But you, Bethlehem Ephrathah, though you are small among the clans of Judah, out of you will come for me one who will be ruler over Israel, whose origins are from of old, from ancient times. Therefore Israel will be abandoned until the time when she who is in labor bears a son, and the rest of his brothers return to join the Israelites.He will stand and shepherd his flock in the strength of the Lord, in the majesty of the name of the Lord his God. And they will live securely, for then his greatness will reach to the ends of the earth. Micah is talking about us – the Gentiles – the “rest of the brothers!” My favorite Christmas verse is the first part of verse 5: And he will be our peace. Jesus was and is our peace. I am not one of those who is constantly looking for end-times’ signs. I (right, wrong, indifferent) don’t get hung up in the calendar. I am fully certain, though, Jesus will return as He promised. Our responsibility is to be personally ready and to be obedient to His Great Commission to tell others. “O Come, O Come Emmanuel.” God is with us. I believe. I have challenged myself to study a different scripture each day during Carols Week that explains the text of one of the songs in The Hope of Christmas. (Sanctuary Choir members – as you prepare for this week, I challenge you to do the same.) It is so important that we internalize what we are sharing through music and drama. I started with what I already know will be my favorite song – New Jerusalem. Catherine Carter Sledge is the soloist (and Choir President) and sang this during worship on December 1. During Carols, this is toward the end of the concert but oh how it ties everything we are sharing together. Honestly – these verses just scratch the surface. Read the entire chapter. Verse 4 is one of my all time favorites and reminds us that in heaven the tears are gone – no need for them ever again. Think about it. God provided that Lamb. Do you know Him? Have you found The Hope of Christmas? When talking about my role with the First Jackson Sanctuary Choir and particularly with Carols by Candlelight, I almost always describe what I do in terms of “herding cats.” I visited that topic in my blog last year about this time. In a spiritual sense, I wonder if that is how Jesus feels about us? I am certain He certainly has more patience WITH me than I do with others and certainly with myself. Somewhere along life’s journey, I developed (inherited?) this “it has to be perfect” gene. Steve, using Mythbusters‘ logic believes that “failure is always an option.” I just don’t see it that way. Never have. Not likely to start now. So I expect a lot of others and a whole lot of myself. It is that important to me. I could write a book about Carols “behind the scenes”. This is my 33rd and the 44th overall. Trust me – there is a lot of material. I doubt I would ever take that route as it would take away from the mission and ministry goals – telling the Story of Jesus in a way that every man, woman or child can understand and believe. If we share the Story as a muddled message, then we are not God honoring in what we are doing. I believe because I know the hearts of the people in the trenches that their desire is the same as mine – to tell others the Story of Jesus. While many who come into the Sanctuary at First Jackson over those three days are “church members” from literally around the world, they are not all Christ Followers. The do not know Him personally. They are literally without hope. Some don’t even realize that until they find themselves in crisis – family, health, financial, whatever – and realize they have nothing – no faith – upon which to fall back. 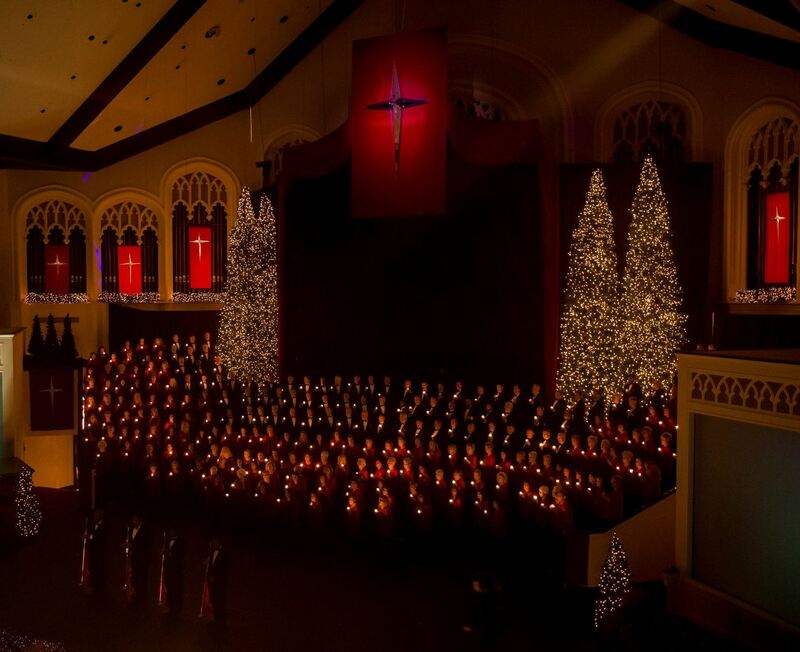 So as we prepare to share The Hope of Christmas beginning December 13th, it is my prayer that seeds be planted, seeds planted elsewhere be nurtured, and that the preparation of the Sanctuary Choir, the children and youth, the orchestra, the production team, and countless other volunteers will be Christ focused. This should never be, as Dr. Pollard used to say, “a nervously clocked hour of religious entertainment.” Carols should be a shared experience of worship where God, and God alone, is the Sole Object of our worship. I have great faith that the “cats” will get it all together. They actually did great in the first rehearsal last week. More importantly, I pray for those who need Jesus that somehow through something we say, sing or do, that they will “get it”. I ask that you pray for them, too. Christ commanded us to “go”. Through Carols, we are doing that by taking tickets to folks to come, inviting folks to watch online or via television and being available to go to answer questions and pray with them as their journey continues. I know The Hope of Christmas born those many years ago so innocently in that stable is the same Hope Who died for me and rose again after three days in that tomb. Do you? Have you shared Him today?